The Brotherhood is home to friendly people, check out their individual pages right here! Thank You & Small Creator Support GiveawayI am extremely grateful for the support I have received on my channel, hitting 470 subscribers is something I never thought would happen, I haven't been focusing on my own channel much as I have been trying my hardest to help others. I just want to say I have noticed and I am thankful, so I am going to combine what I have been trying to do and a thank you all in one. I am running a giveaway which will be drawn at the end of the week. It will run through gleam.io and when it is drawn I will be vetting out bots that will inevitably get thrown into the mix, so that the competition is as fair as possible. Grab some Unkindbrotherhood apparel or accessories and support troops with PTSD, 100% of profits go to the PTSD Foundation of America. 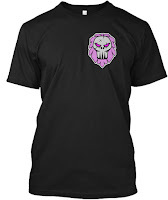 14 Days to support the troops by grabbing some apparel or accessories, once the campaign is complete Teespring will ship your order. Q. You're Based in Australia Why Do you Care About US Troops? A. We may be based in Australia but we have members from all parts of the globe. A. "Personally growing up in a military family, I have seen what it can do to people. I would never wish this upon anyone." ~Jolt. Q. I don't live in the US can I still support and receive my item/s? A. Of course! Teespring ships globally. The Dissolution of the creative team Unkindjolt, Co-Founder It is with a heavy heart that I write this message to confirm the end of the creative team, over what seems both a short and a long period of time of our existence as a group that wished to create content together, life has gotten in the way and with zero funding or a way to move forward, the group must dissolve as a "business style" group. From here onwards we will no longer be accepting new members into the group in the form of creators or designers. We would like to formally extend an invitation to those who would still like to collaborate but for now, the group is basically returning to a casual community for gaming and just being friends. Any contracts regarding members or commission are now forfeit no sales were made at all during the time our store site was up in 2016/2017. A future for merchandise may still be available down the track and would be in the form of apparel and accessories hosted by teespring.